Instant messaging technology has been around since the 1960s. However, it was not until late 1990s that chat / IM desktop clients like AOL Messenger came out and totally revolutionized the way we communicate across borders. What’s more surprising is that the long-established technology has stood the test of time and has constantly been evolving decade after decade. In the recent years, the Instant Messaging scene has gone through another such transition by making its foray into the mobile space. Numerous IM clients for iPhone, Nokia and Blackberry are already out there for download, many of which are completely free. 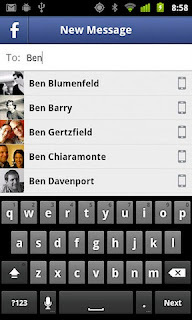 On Android too, there’s a surplus of such apps; however it does get rather hard for users to pick out the best once. So, if you’re looking for a good IM client on Android, don’t worry, we’ve done all the hard work for you and compiled a list of some of the best IM clients out there. 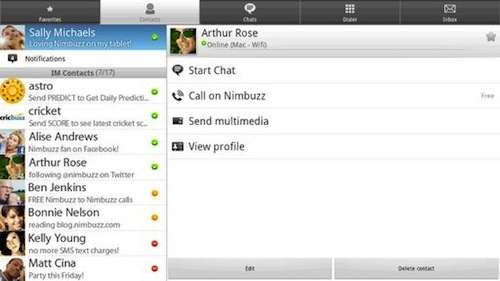 Nimbuzz is a popular all-in-one communications client for mobile phones. Apart from letting users call and message each other without any charge, this free application also comes with a fully featured IM client with built-in support for Yahoo Messenger, MSN Messenger (Windows Live Messenger), Google Talk, Myspace and Hyves. Being one of the very few clients that support HD calling, Nimbuzz does outshine the rest when it comes to features and stability. With over 60 million registered users, Nimbuzz is freely available for download from the marketplace. 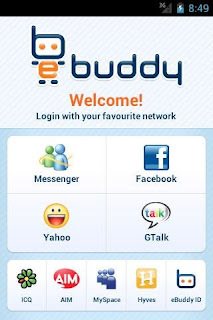 eBuddy is another well-known chat client that comes with support for a huge number of IM services. 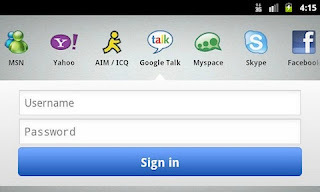 The free application has built-in support for Yahoo Messenger, MSN, AIM, GTalk, ICQ, Facebook, and Hyves. Since the app runs in background, you can receive messages from your chat buddies even while you’re not using the phone. 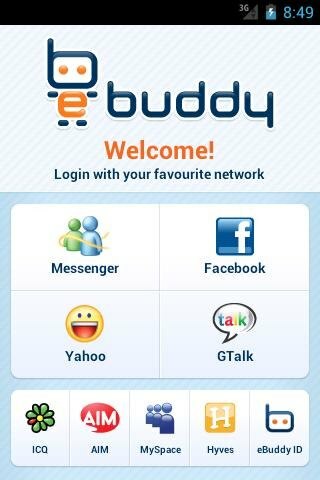 If you’re just looking for a feature-laden all-in-one IM client then eBuddy should be your pick. 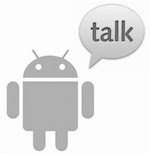 This next app delivers the once-trendy IM experience on your Android device. With beta support for voice calls and video calls, Yahoo Messenger for Android includes an interface that’s quite similar to what you’ll find on its desktop or web version. You can share photos, videos, and also connect with your buddies on Windows Live Messenger and Facebook. Rated 3.9 stars and with over 5 million downloads so far, Yahoo Messenger is a great choice for those who’ve been loyal users of the service. Specially designed for Facebook junkies, this next app lets you stay connected with your FB ‘friends’ on the go. Since Faceboook Messenger works across all major mobile platforms, you won’t have to badger your friends to switch to Android just for this app. Moreover, if any of your friends doesn’t have the app just yet, it also lets you bug them by sending text messages. If you’re an avid FB user, I bet you’ve already skipped this section. Though not developed by the Android-loving Microsoft, Messenger With You (MWY) is the closest you’ll get to using MSN messenger on your Droid. With support for MSN and Yahoo Messenger, MWY comes with an impressive list of features that have made it quite popular in the marketplace. 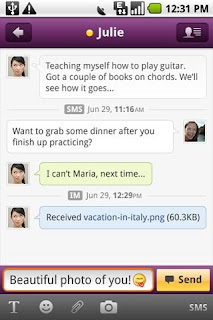 Moreover, the free app also includes support for group chat as well as file transfer. Despite there’s being an overload of all-in-one IM client apps in the market place, IMO stands out from the crowd with its simple, no-fuss approach to instant messaging. First of all, unlike the aforementioned Nimbuzz or eBuddy, you don’t need to create a separate IMO account. Just plug in your IM service’s credentials and you’re good to go. Secondly, IMO supports a vast number of services which include Facebook, Skype, Yahoo Messenger, Windows Live Messenger, Google Talk, AIM, Hyves and a few others, making it a one-stop solution to all your IM needs. There are also other great features like Voice IMs, concurrent sessions, photo sharing, etc., which are quite unique. Rated 4.3 out of 5 stars, Imo Instant Messenger is freely available for download from the marketplace.